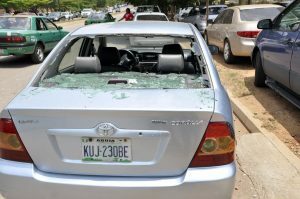 For the second day, yesterday, the Nigeria Police Force and the Islamic Movement of Nigeria (IMN) clashed in Abuja over the group’s demand for the release of Shiite leader, Ibrahim El-Zakzaky. 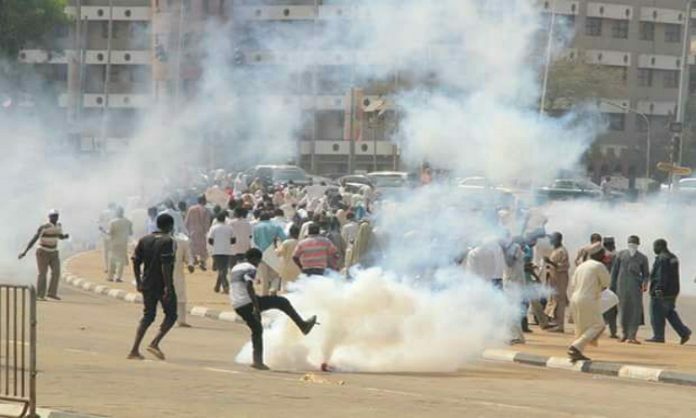 Police fired teargas at IMN protesters who demanded El-Zakzaky’s release. The cleric has been in detention since December 2015. 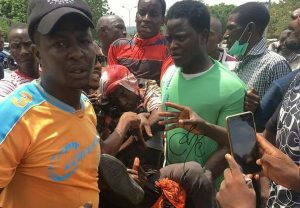 Scores of protesters were also arrested by armed police wearing bulletproof vests and gas masks during clashes in Abuja, the nation’s capital. The IMN leader has been in custody since soldiers clashed with his followers in Zaria, Kaduna State, in December 2015, despite court orders that he should be freed. More than 350 IMN followers were allegedly killed in the 2015 clashes. Zakzaky was shot and injured, leaving him partly paralysed and blind in one eye.The Shi’ite leader has repeatedly been imprisoned for alleged incitement and subversion. IMN has been in conflict with the Nigerian government for years, seeking to foment an Iranian-style Islamic revolution in the country’s Sunni Muslim-majority North. 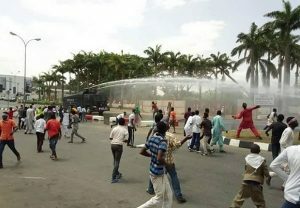 Zakzaky’s followers on Monday had clashed with the police in Abuja’s Maitama area and police made at least 115 arrests. Meanwhile, IMN has confirmed it held yesterday’s protest at the Wuse Ultra-Modern Market, Abuja. The group also claimed 30 of its members went missing after a previous protest at the Central Business District in Abuja on Monday. Although the police denied any casualties during Monday’s protest, a leader of the group, Abdullahi Musa, said a member was shot in the head, resulting in serious brain injury on Monday. He added that the affected Shi’ite member was rushed to Kano for further treatment: “One of us was shot in the head yesterday (Monday). His brain came out. He was rushed to the Aminu Kano Teaching Hospital for further treatment. Musa further said that although he could not tell how many members were arrested on Tuesday, three truckloads of IMN members were taken away by police at the Wuse Market. “I saw them take three truckloads of our members today. They, however, did not use live ammunition today, except sticks and teargas. I was badly beaten with sticks by the police,” Musa said. Meanwhile, Amnesty International has condemned the reaction of the police to the two-day Shi’ite protests. In a statement signed by director, Amnesty International Nigeria, Osai Ojigho, the organisation said the crackdown on unarmed protesters put lives at risk. In its statement yesterday, Amnesty International said the iron fist applied against the protesters was unnecessary. “Although there were reports that stones were thrown by some protestors, there is no excuse for the use of live bullets, water cannon and tear gas. These were highly reckless tactics that could easily have resulted in fatalities. Nigerian authorities must adhere to the rule of law and respect the right to peaceful protest when policing these events,” Amnesty said. It also described the arrest of 115 protesters as a worrying sign of repression of the IMN.